Aristotle. (1980). The Nicomachean ethics. Oxford: Oxford University Press. Barr, R. y Tagg, J. (1995). From teaching to learning: A new paradigm for undergraduate education. Change, 27(6), 13–25. Biesta, G. (2004). Against learning. Reclaiming a language for education in an age of learning. Nordisk Pedagogik, 23, 70–82. Biesta, G. (2006). Beyond learning. Democratic education for a human future. Boulder, Co.: Paradigm Publishers. Biesta, G. (2007). Why ‘what works’ won’t work. Evidence– based practice and the democratic deficit of educational research. Educational Theory, 57(1), 1–22. Biesta, G. (2009a). Theorising learning through complexity: An educational critique. Complicity, 6(1), 28–33. Biesta, G. (2009b). What is at stake in a pedagogy of interruption? En T. E. Lewis, J. G. A. Grinberg y M. Laverty (eds.). Philosophy of Education: Modern and Contemporary Ideas at Play (pp. 785–807). Dubuque, IA: Kendall/ Hunt. Biesta, G. (2010a). Good education in an age of measurement: Ethics, politics, democracy. Boulder, Co: Paradigm Publishers. Biesta, G. (2010b). Why ‘what works’ still won’t work. From evidence–based education to value–based education. Studies in Philosophy and Education, 29(5), 491–503. Biesta, G. (2011). Disciplines and theory in the academic study of education: A comparative analysis of the Anglo–American and continental construction of the field. Pedagogy, Culture and Society, 19(2), 175–192. Biesta, G. (2012). The educational significance of the experience of resistance: Schooling and the dialogue between child and world. Other Education: The Journal of Educational Alternatives, 1(1), 92–103. Biesta, G. (en prensa–a). Interrupting the politics of learning, changing the discourse of education. Power and Education. Biesta, G. (en prensa–c). The beautiful risk of education. Boulder, CO: Paradigm Publishers. Biesta, G. (en prensa–d). Becoming educationally wise: Towards a virtue–based conception of teaching and teacher education. In A. L. Østern, K. Smith, T. Ryghaug, T. Krüger y M. B. Postholm (eds.). Teacher education research between national identity and global trends. Trondheim: Nafol. Bingham, C. (2009). Authority is relational. Albany, NY: suny Press. Derrida, J. (1992a). Given time: I. counterfeit money. (P. Kamuf, trad.). Chicago: University of Chicago Press. Derrida, J. (1992b). Force of law: The “mystical foundation of authority”. En D. Cornell, M. Rosenfeld y G. Carlson (eds.). Deconstruction and the possibility of justice (pp. 3–67). Nueva York y Londres: Routledge. Ellsworth, E. (2004). Places of learning: Media, architecture, pedagogy. Nueva York: Routledge. Field, J. (2000). Lifelong learning and the new educational order. Stoke–on–Trent: Trentham Books. Giesecke, H. (1985). Das Ende der Erziehung. Stuttgart: Klett–Cotta. Giroux, H. (1983). Theory and resistance in education: A pedagogy for the opposition. South Hadley, MA: Bergin y Garvey. Gundem, B. y Hopmann, S. (eds.). (1998). Didaktik and/or curriculum. Nueva York: Peter Lang. Haugsbakk, G. y Nordkvelle, Y. (2007). The rhetoric of ict and the new language of learning. A critical analysis of the use of ict in the curricular field. 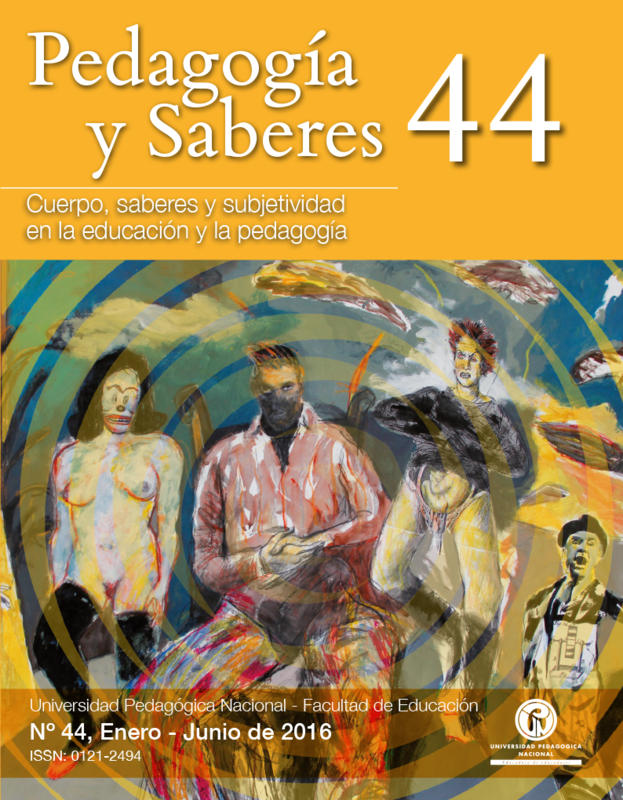 European Educational Research Journal, 6(1), 1–12. Komter, A. (1996). The gift: An interdisciplinary perspective. Amsterdam: Amsterdam University Press. Levinas, E. (1969). Totality and infinity: An essay on exteriority. Pittsburgh: Duquesne University Press. Meirieu, P. (2008). Pédagogie: Le devoir de résister. Nouvelle édition complétée 2008. Issy–les–Moulineaux: ESF éditeur. Nancy, J. (2000). L’intrus. París: Gallilée. Nola, R. e Irzik, G. (2005). Philosophy, science, education and culture. Dordrecht: Springer. Pinar, W. (ed.). (1998). Contemporary curriculum discourses. Nueva York: Peter Lang. Pinar, W. Reynolds, W. Slattery, P. y Taubman, P. (1995). Understanding curriculum. Nueva York: Peter Lang. Plato. (2008). Meno. (B. Jowett, trad.). Recuperado de http://www.gutenberg.org/files/1643/1643–h/1643–h.htm. Priestley, M.; Biesta, G. y Robinson, S. (2012). Teacher beliefs and the achievement of agency. Manuscrito en preparación. Stirling: University of Stirling. Recuperado de http://www.ioe.stir.ac.uk/events/tacc.php. Roth, W. (2011). Passability: At the limits of the constructivist metaphor. Dordrecht: Springer. Wimmer, M. (2001). The gift of “Bildung”. En G. J. J. Biesta y D. Egea–Kuehne (eds.). Derrida & Education (pp. 150–175). Londres y Nueva York: Routledge. Winter, P. (2011). Coming into the world, uniqueness, and the beautiful risk of education. An interview with Gert Biesta by Philip Winter. Studies in Philosophy and Education, 30(5), 537–542.